The construction by the Latins of the fortress of Chastellet at the place known as ‘Jacob’s Ford’ or Bait el-Ahzan on the Upper Jordan between Lake Huleh and the Sea of Galilee between October, 1178, and March, 1179, and Saladin’s subsequent and ultimately successful attempt to demolish it in August, 1179, offers an interesting case history for the study of Christian-Muslim warfare in the reign of King Baldwin IV. Although the sources are not copious, they tell us enough to be able to draw some tentative conclusions about the military, economic, and religious significance of a site desired by both sides and the nature of the warfare required to make those desires a reality. The picture which emerges is far removed from the traditional images of the the gallant leper king and the chivalrous Saladin; rather it is one of grim and often desperate conflict, no less brutal and ruthless than its counterparts on western Christendom’s other frontiers in Germany and Spain. Indeed, it could not have been otherwise, for control of this crossing was absolutely crucial to both sides in a way which it had not been in the past. More than any other military event between 1174 and 1187, the loss of this fortification began the process which led to the defeat of the Christians at Hattin. The situation was made all the more critical in that it took place in a year when, according to Imad ad-Din, Saladin’s secretary and chancellor, drought and famine were especially severe, the effects of which could only have been exacerbated by the wholesale seizure or destruction of the harvest. According to one of the versions of the Old French chronicle of Ernoul, who was a contemporary with knowledge of high politics in the Latin kingdom, Baldwin IV had agreed not to fortify the place, but was persuaded by the Templars to renege on his promises. William of Tyre – who was often hostile to the Templars and had a particular hatred for Odo of Saint-Amand, the reigning Master – nevertheless says only that the king began to build the fortress, although he implies that the Templars were behind it, when he states that, on completion, it ‘was surrendered to the brothers of the knights of the Temple, who laid claim to all that region for themselves by concession of the kings’. A truce had indeed been made with Saladin after the Frankish victory at Mont Gisard (south-east of Ramla) in November of the previous year, but neither side seems to have been very committed to it, since the Franks had attacked Hamah in August, 1178, while Saladin’s preparations for a new campaign were fairly obvious.However, the Templars did have a particular interest in the area; in 1168 King Amalric had granted them the important fortress of Safad, which was only about fifteen kilometres (or half a day’s journey, according to Imad ad-Din) to the south-west. Safad – described by Imad ad-Din as ‘a nest of evil' – dominated northern Galilee, but could not by itself prevent incursions from the east across the Jordan. William of Tyre says that the castle at Jacob’s Ford took six months to build, although it was apparently not finished in mid-April, 1179, when the dying constable, Humphrey of Toron, was taken there. It was in the form of a square with very thick walls, described as of ‘suitable height’ (ad convenientem altitudinem), and was situated upon a shallow hill (mediocriter eminens). On the Muslim side, the Mesopotamian chronicler, Ibn al-Athir, calls it ‘an impregnable fortress’, although perhaps exaggerating its strength added further gloss to the Muslim capture and destruction of it. In fact, neither writer actually saw it; much more detailed is the account of the Qadi al-Fadil, Saladin’s administrator. His description is contained in a letter to Baghdad incorporated into the patchwork of sources sewn together by the anthologist Abu Shama in the mid-thirteenth century. Al-Fadil either saw it himself or had his information directly from Saladin, since he often wrote letters on the sultan’s behalf. There seems to have been a keep on the western side, as Saladin’s forces concentrated their efforts upon mining what Imad ad-Din calls ‘a tower of extreme solidity’ and Ibn al-Athir describes as ‘a citadel’. It may have been hexagonal in shape, since al-Fadil believed that mines were dug on five sides of the walls. In another letter, al-Fadil says that there was ‘a vast enclosure adjoining the castle’, which may have been the quarters of the service community needed to run it. The castle was well-stocked with food, which al-Fadil estimated would have lasted for several years, and it incorporated a cistern so large that, after the castle’s fall, the Muslims used it to dispose of the unwanted bodies of their enemies, but failed to fill it with, he claims, 1,000 cadavers. The garrison included ‘eighty knights with their squires, fifteen chiefs each having with them fifty men’ and ‘artisans such as a mason, architect, blacksmith, carpenter, sword-cutter, armourer, and maker of arms of all types’. There were 100 Muslim slaves. The fighting men were appropriately equipped: when the faubourg fell, the Muslims seized many horses, while in the castle itself they found about 1,000 coats of mail. The castle was apparently built while Saladin was preoccupied with besieging Baalbeck, a situation which had arisen out of the complicated internal politics of Muslim Syria, and which was not resolved until the city capitulated in the spring of 1179. Saladin’s Syrian problems cannot have been unknown to the Franks; perhaps the Templars had been anxious to take this opportunity, despite the existence of the truce. However, once free of Baalbeck, Saladin retired to Damascus – only a day’s journey from Jacob’s Ford, according to Imad ad-Din – to assess the new situation. According to Ibn Abi Tayy, a source now lost, but also partially incorporated by Abu Shama, he first offered the Franks 60,000 dinars to dismantle it, gradually increasing the sum to 100,000, but with no success. These figures seem to have been based on al-Fadil’s estimate that the Franks had used 20,000 stones costing at least four dinars each. If the Franks could not be bought out, then force would have to be used. Taqi al-Din, the sultan’s nephew, advised Saladin to use the money to equip troops instead. Saladin began by ravaging the region upon which the castle depended, a tactic which suggests that the garrison was unable to prevent Muslim troops from regularly entering Frankish territory. As was usual, large areas were set on fire, but Saladin also sent out raiding parties to seize the harvest. Imad ad-Din says that ‘it was not long before he [Saladin] saw them return, bringing back their camels loaded with heavy sheafs; it was thus until the complete destruction of the crops’. Evidently the need to feed troops in a year of acute shortage led to a less profligate approach to the ravaging of the enemy’s lands than was normal. In late May, he made some preliminary sorties against the castle itself to test its strength, but, according to William of Tyre, retreated when one of his more prominent emirs was killed in the fighting. During all this military activity, Saladin became involved in a battle he had not sought, for the king and the Templars had brought up an army to stop these attacks. On June 10, 1179, the Christians defeated an advance section of Saladin’s forces under Farrukh-Shah, another of the sultan’s nephews, at Marj Ayun, but when Raymond of Tripoli and Odo of St. Amand, the Master of the Temple, tried to follow this up by charging the main force, they were heavily defeated. Odo of St Amand was among those captured. Imad ad-Din reckoned that 270 knights were taken at this time. The actual siege began on August 24th, when Saladin arrived at the ford with numbers which leave no doubt as to the seriousness of the attack. The plain overflowed with troops, says Imad ad-Din. The region around Safad was raided for vine-poles and other wood to support the palisades protecting the mangonels. The outer compound was captured by the evening of the first day; Ibn al-Athir says that the troops were inspired by a person he calls ‘a man of the people, wearing a torn tunic’, who set the example by being the first to climb up onto the wall. Al-Fadil was deeply impressed by the sight. As he watched, the violet shadows were dissolved by the crimson of the fire: ‘it seemed that the dawn had invaded the night’, he says. According to him, in the morning, the commander of the castle, who must have been a Templar, despaired of the defence. ‘When the flames reached his side, he threw himself into a hole full of fire without fear of the intense heat and, from this brazier, he was immediately thrown into another [that of Hell].’ So important was this to Saladin that he tore at the stones of the fortress with his own hands. He destroyed it ‘as one effaces the letter of a parchment’. Imad ad-Din says that Saladin stayed fourteen days in all, including the siege. Before returning to Damascus though, he ravaged the regions around Tiberias, Tyre and Beirut, in order to spread terror. Saladin may well have been right, for Latin strategy seems to have been driven more and more by the military orders, who perhaps had a better appreciation of the need to adopt such a policy than any individual lord or even the king. The Templars were acutely conscious of the frontiers: they were already established in the north in the Amanus Mountains, in the centre in southern Tripoli, and in the south around Gaza. The reinforcement of their enclave around Safad in Galilee was a logical further step. Imad ad-Din says that Saladin’s advisers told him that ‘Jacob’s Ford was built to command the weak points of the Muslim frontier and render passage very difficult’.Moreover, for the Templars it had an added advantage. Ibn Abi Tayy, quoted by Abu Shama, says that ‘this strong castle appertained to the Templars who had furnished the garrison abundantly with victuals and weapons of all kinds, in order that they could pillage Muslim caravans’. This was, indeed, an established part of the Templar repertoire, and had already proved very profitable in the south, most notably in the attack on the caravan of Nasir al-Din of Egypt in 1154. Smail’s impression that there was no coherent frontier policy may well therefore have been derived from his observation of the piecemeal and inconsistent approach which resulted from extensive noble autonomy in the earlier part of the twelfth century: the military orders seem to have been in the process of changing that in the years before Hattin. As the account of the conflict shows, the warfare which resulted from these suppositions was devastating. Setting aside the defeat at Marj Ayun which preceded the siege, the Franks lost the entire garrison, either killed or enslaved. Imad ad-Din says that of the 700 or so prisoners taken, the greater part were massacred, while the rest went to the Damascus slave markets. This includes the eighty knights of the garrison, all or most of whom must have been Templars. Nor was the victory without cost to the Muslims for, soon after, disease broke out among Saladin’s troops, ‘as a consequence of the extreme heat and the stench of the cadvers’. Ten of his emirs died from this.The material costs were also immense. Apart from a castle worth at least 100,000 dinars, the pillaging and wasting of the surrounding countryside in, it must be remembered, a year of drought and famine, meant that it was never again practical to consider erecting a castle at the ford. It may, indeed, have been the beginning of the decline of Safad, described by the bishop of Marseille in 1240 as little more than a heap of stones in which lived an impoverished Templar garrison. In April, 1180, Farrukh-Shah devastated the region around Safad, apparently without opposition. According to al-Fadil, after the destruction of Jacob’s Ford there was nowhere habitable for the Franks in that region ‘other than the fortresses and the towns’. By the summer of 1176 Saladin was profoundly worried about the situation. Ibn Abi Tayy says that this was one of the main reasons why he made peace with Sinan ibn-Salman, the Assassin leader, whose fortress of Masyaf he had been besieging, and concentrated his attention upon the Latins. ‘He feared that the Franks would only profit from his removal to stir up troubles in upper Syria and realise great advantages there.' He was correct in this assessment, for the Latins were able to mount two expeditions in the region with the help of Philip, Count of Flanders, who had arrived at Acre in September, 1177. The Muslims took his presence extremely seriously. Imad ad-Din describes him as ‘one of the most powerful chiefs among the infidels’, who believed that the Muslims should be driven out of Syria entirely, while Ibn al-Athir saw him as ‘one of their most redoubtable tyrants’. In October, Philip besieged Hamah in association with Raymond of Tripoli and, the next month, moved against Harim with Bohemond of Antioch. Ibn Shaddad, Baha al-Din, who, although he only entered Saladin’s service in 1188, is a reliable source for these years as well, says that news of dissension between as-Salih, ruler of Aleppo and son of Nur-ad-Din, and Kemechtekin, his governor of Harim, had ‘excited the ambition of the Franks’. Although neither attack was successful, in the estimation of Ibn al-Athir the siege of Hamah was so ferocious that they came very close to taking the place, while William of Tyre thought that Harim had almost been within the grasp of the Christians. But these failures of the Christians were minor compared to Saladin’s attempt to take advantage of their activity in Syria by invading the southern part of the kingdom, which led to his severe defeat at Mont Gisard on November 25th. Imad ad-Din does not try to hide the extent of this blow, calling it ‘a disasterous event, a terrible catastrophe’, while Ibn Shaddad believed that it was so damaging that the Almighty ‘had repaired it afterwards with the celebrated victory of Hattin’. Although Farrukh-Shah inflicted considerable damage on Baldwin’s army at Belfort, near Banyas, on April 10, 1179, and Saladin himself managed to turn a dangerous situation to his own advantage at Marj Ayun two months later, the military record of the sultan and his allies against the Franks between 1174 and 1179 overall is at best mediocre, emphasising even more strongly how important it was for the Muslims to prevent the long-term establishment of the castle at Jacob’s Ford. A comparison of the situations before and after Jacob’s Ford brings out the point with some force. In 1174 Saladin had failed to take Aleppo, without which he would be unable to surround the Franks. In the years which followed he had met with relatively little success in his attempts to harass the enemy within its own lands; indeed, it was the Franks who often took the initiative, culminating in the attempt to build Chastellet. Yet, with the notable exception of Reynald of Châtillon, Frankish military activity between 1180 and 1187 was almost entirely reactive, characterised by frantic attempts to plug holes in their defences as Saladin’s forces made regular incursions into Galilee in the north, battered away at Kerak in the south-east, and even opened up a new frontier on the west by making hitherto unprecedented naval attacks, including one on the port of Acre – ‘the Constantinople of the Franks' – in October, 1179. Although the fall of this cave fortress was attributed by the Franks to Syrian treachery, its position to the south-east of the Sea of Galilee, almost equidistant from Tiberias and Baisan to the west, was quite isolated. Farrukh-Shah was able to take back ‘a rich booty’ from this raid, which included 1,000 captives and 20,000 animals. Consequently, by late July Saladin himself was raiding into the districts of Tiberias and Baisan, and fought a hard battle with the Franks below Belvoir from which neither side could claim a clear victory. Although Raymond of Tripoli achieved a rare Frankish success when he recaptured Habis Jaldak in December, 1182, this was a minor success compared to the surrender of Aleppo to Saladin on June 12, 1183. The Christians were under no illusions about the significance of this: from now on, they were, says William of Tyre, ‘almost besieged’. The campaign which followed led to the stand-off by the main Frankish army at Saffuriyah when attacked by the Muslims on October 8th, a tactic which kept the army largely intact, but which lost Guy of Lusignan the regency soon after. So dominant had Saladin’s troops been during the eight days which this lasted, the army nearly starved, since nobody was able to bring provisions. The repercussions can be seen before Hattin in July, 1187, when Guy, acutely aware of this campaign, chose to march to relieve Tiberias rather than stay encamped at Saffuriyah. The importance to Saladin of the destruction of the Frankish castle at Jacob’s Ford is further underlined by his frustration at not being able to take Kerak, which occupied an equally key position to the south-east of the kingdom. Kerak was more difficult to overcome because it was a completed fortress, which made skilful use of its defensive position along a narrow ridge. Even though it was sometimes possible to take the lower town, ‘the large and deep fosse, formed by a frightful ravine’, described by Imad ad-Din, proved impassable, despite really sustained efforts by Saladin in November and December, 1183, and again the following autumn. Al-Fadil’s lament in one of his letters conveys some sense of what Kerak meant to the Muslims. 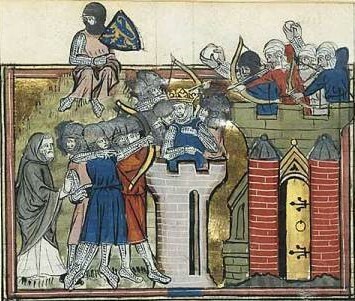 Saladin’s frustration was increased many times over by the aggressive policies of its lord, Reynald of Châtillon, whose daring raid upon the Red Sea ports in the autumn, 1182, and attacks on Muslims caravans in the Moab at the end of 1186, breaching an established truce, so angered him that Saladin ‘swore that he would have his life’. Muslim hostility was partly based on fear that the Franks would find their way into this area regularly, using Kerak as a base. When, in February, 1183, some of the Franks involved in the attack along the coast of the Hidjaz were captured, Saladin ordered that there should not ‘remain among them either an eye capable of seeing nor a single man capable of indicating or even knowing the route from this sea.' Ibn al-Athir saw Reynald of Châtillon as ‘the most hostile of all [the Frankish demons] against the Muslims’, while Imad ad-Din calls him ‘the most perfidious and the most evil of the Franks, the most avid, the most eager to do injury and to make evil,…' In fact the depth of hatred for Reynald of Châtillon which is conveyed in Muslim sources indicates very clearly just how much damage he was capable of inflicting, partly because of the nature of his personality and partly because of his possession of Kerak. A castle at Jacob’s Ford, under the command of a powerful garrison of Templars, would surely have been at least as dangerous to the territory of Damascus and to Muslim armies and caravans travelling there. It seems therefore that, during the reign of Baldwin IV, the struggle to gain control over the eastern frontier of the Kingdom of Jerusalem, became the crucial element in the survival of the crusader states. Both sides recognised this and were prepared to throw in resources of manpower and materials on a huge scale. The warfare which resulted was deeply destructive of the environment, in particular of Galilee, and profligate of human life. In such circumstances each new conflict increased the depth of bitterness still further, so ultimately there could be no compromise. Even if Imad ad-Din’s claim that Raymond of Tripoli would have embraced Islam ‘had he not feared the people of his religion’, cannot be substantiated, there is no doubt that Raymond’s attempts to secure some favour with Saladin can have done little for his credibility among those who had suffered from the devastation of the frontier warfare of these years. Indeed, whatever may have been the contacts from time to time between individual Christians and Muslims, the basic struggle over possession of places holy to both religions remained. Jacob’s Ford had great strategic importance, but this too was also a religious site. William of Tyre explained that old traditions say that ‘this is the place where Jacob, returning from Mesopotamia, having sent messengers to his brother and divided the people into two parts, said, “With my staff I have crossed the Jordan and now I am returning with two groups” [Gen. 32.10].' According to Genesis 32:10 Jacob did indeed cross the Jordan here on the way to meet his brother Esau. However, like so many sites in the region, it also had its significance to the Muslims. There are various legends about Jacob in Islamic literature and he is discussed in the Koran. Early Meccan surahs make him the brother rather than the son of Isaac. This fits with Imad ad-Din’s statement that, after the fall of the fortress, the ford ‘became a place of pilgrimage as before, sanctified by the actions of grace and prayers of the Muslims’. At Jacob’s Ford, the calculations of the strategists were reinforced by the certainties of belief. The failure to complete and secure the castle at Jacob’s Ford in 1178 and 1179 can be seen, at least in retrospect, as a major turning-point for the Franks. Although the sides settled on a two-year truce after the fall of the castle, William of Tyre believed that Saladin had agreed to this not from fear of the Franks, but because of the problems caused by the recent five-year drought in the region of Damascus. In William’s estimation, the balance had already changed, for he knew of no other instance in which the Franks had been obliged to make a truce without laying down at least some conditions. While some allowance needs to be made for William’s anxiety to stress to a western audience the danger which Jerusalem faced, nevertheless the expiry of truce coincided with the loss of Byzantine support after the installation of the anti-Latin regime of Andronicus Comnenus in September, 1182, a notable absence of heavyweight crusaders from the west equivalent to Philip of Flanders, and the increasing mental and physical paralysis of a king now clearly losing his fight against leprosy. What followed was the bleakest period of the existence of the crusader states in the whole of the twelfth century. Abu Shama, Le Livre des Deux Jardins, in Recueil des Historiens des Croisades. Historiens Orientaux, vol. IV (Paris, 1898), 195. Guillaume de Tyr, Chronique, ed. R.B.C Huygens, Corpus Christianorum. Continuatio Mediaevalis 63A (Turnhout, 1986), 21.29 (30), 1003. William had in fact set out for the Third Lateran Council in Rome in the same month as work on the fortress began, so he may not have been fully informed of the circumstances which led to the decision to build, 21.25(26), 997. On William’s view of Odo of St Amand, 21.28(29), 1002. Baldwin IV was at Jacob’s Ford on November 17, 1178, and again on April 1 and 2, 1179, R. Röhricht, ed., Regesta Regni Hierosolymitani (Innsbruck, 1893), nos. 562, 577, 579. Ibn al-Athir, Extrait de la Chronique intitulé Kamel-Altevarykh, in RHC Cr. Orientaux, vol.1 (Paris, 1872), 632. E. Strehlke, ed., Tabulae ordinis Theutonici (Berlin, 1869) (reprint 1975), no.4, 5-6. Guillaume de Tyr, 21.25(26), 997; 26(27), 999. Abu Shama, 204, 208; Ibn al-Athir, 638. Abu Shama, 207-8. Compare the forces needed to garrison Safad in the 1240s, where the figures given are 50 knights, 30 sergeants, 50 Turcopoles, and 300 crossbowmen, plus 820 workers of other kinds and 400 slaves, R.B.C. Huygens, ed., ‘De constructione castri Saphet’, Studi Medievali ser.3, 6 (1965), 384. See M.C. Lyons and D.E.P. Jackson, Saladin. The Politics of the Holy War (Cambridge, 1982), 131-3. Abu Shama, 197; Ibn al-Athir, 636; Guillaume de Tyr, 21.26(27), 999-1000. R.C. Smail, Crusading Warfare (1097-1193) (Cambridge, 1956), 207-8. Abu Shama, 194. Recent studies confirm the increase in the relative importance of the military orders. See S. Tibble, Monarchy and Lordships in the Latin Kingdom of Jerusalem 1099-1291 (Oxford, 1989), 158-61, for the growth of the influence of the military orders in Galilee, and A. Jotischky, The Perfection of Solitude. Hermits and Monks in the Crusader States (Pennsylvania, 1995), 61-2, for the way that monastic foundations sought the protection of the orders in vulnerable areas. Guillaume de Tyr, 18.9, 822-3. William gives this story an anti-Templar slant, but however the incident is interpreted, it is clear that the Templars were using their base at Gaza in this way. Abu Shama, 191; Ibn al-Athir, 630. Ibn al-Athir, 630; Guillaume de Tyr, 21.24(25), 995. Both sources agree that the Latins allowed themselves to be bought off at Harim, a circumstance which only increased William’s mistrust of Philip of Flanders. Although this left Saladin free to pursue other goals within the Muslim world, the effort involved in the campaigns of 1178-9 had so exhausted the Franks, they were only too pleased to accept a respite. Abu Shama, 218. Ibn al-Athir, 652, describes the rock fortress as a great source of damage to the Muslims. Guillaume de Tyr, 22.16(15), 1029. Guillaume de Tyr, 22.25(24), 1047. Guillaume de Tyr, 22.28(27), 1053, on the starvation. The success of the waiting tactic was only relative, for the skirmishing involved took a considerable toll. Saladin’s initial attack on the Franks at Saffuriyah on October 1st is described by Ibn Shaddad as a bloody encounter, which cost many dead and wounded, Abu Shama, 243. On the links between these events and their effects on Guy’s behaviour, see P. Edbury, ‘Propaganda and Faction in the Kingdom of Jerusalem: the Background to Hattin’, in M. Shatzmiller, ed., Crusaders and Muslims in Twelfth-Century Syria (Leiden, 1993), especially 177-8, 189. Abu Shama, 253. For the details of this castle, see H. Kennedy, Crusader Castles (Cambridge, 1994), 45-52. Ibn al-Athir, 647; Abu Shama, 251. See also B. Hamilton, ‘The Elephant of Christ: Reynald of Châtillon’, in Studies in Church History, 15 (1978), 97-108, who argues that ‘in the second half of his public life [i.e. after his release from prison in 1176] he was sincerely committed to the crusader cause in a way in which he had not earlier been.’ (99). This may be taking the rehabilitation of Reynald a little too far, but whatever his motives, it is evident that almost alone among the Franks he was prepared to take the war to the Muslims, rather than simply waiting to be attacked. Guillaume de Tyr, 21.25(26), 997. Guillaume de Tyr, 22.1, 1008. See P.W. Edbury and J.G.Rowe, William of Tyre. Historian of the Latin East (Cambridge, 1988), 171. See, too, the less than flattering assessment of Lyons and Jackson, 240, on Saladin’s overall achievement by early 1186. See B. Hamilton, ‘Manuel I Comnenus and Baldwin IV of Jerusalem’, in Kathegetria. Essays presented to Joan Hussey on her Eightieth Birthday (Camberley, 1988), 353-75, and M. Angold, The Byzantine Empire 1025-1204 (London, 1984), 193, who argues that the Byzantine defeat at Myriokephalon in 1176 was not the major disaster it has been made out to be. Guillaume de Tyr, 22.9, 1020. This article was first published in The Crusades and their Sources: Essays Presented to Bernard Hamilton, edited by John France and William G. Zajac (Aldershot: Ashgate, 1998). We thank Ashgate Publishing and Malcolm Barber for their permission to republish this article. This entry was posted in Articles and tagged 12C, Crusades, Jerusalem, The Campaign of Jacob's Ford 1178-79. Bookmark the permalink.